A carpal tunnel release is a surgical procedure performed to relieve pressure on the nerve located inside the carpal tunnel, an area in the wrist that supplies nerve function to the fingers. The condition for which the release is performed is called carpal tunnel syndrome. Carpal tunnel syndrome is a relatively common problem affecting the wrist and hand. Individuals afflicted with carpal tunnel syndrome complain of numbness, tingling, and pain in the hand, with pain radiating up into the arm, shoulder, and even the neck. Some patients may experience an aching or burning sensation in the affected hand. The fingers may feel swollen, although they are no larger in size. If the condition is left unattended, symptoms may begin to awaken the individuals during sleep. If left unattended medically, muscle weakness can develop, leading to an inability to grasp objects or engage in any action requiring the opposition of the thumb and the other fingers in the affected hand. It is known as a repetitive stress injury, as it most commonly occurs in individuals who engage in motions that require the hands to repeat the same movements over and over again, especially with strong, forceful hand movements or ones that involve vibrating tools. Many individuals develop carpal tunnel syndrome in both hands. For some the condition is worse in the dominant hand. Individuals who perform repetitive wrist movements, either at work or play, are at risk of developing carpal tunnel syndrome. Repetitive movements include computer work, typing, computer games, sports such as tennis, scanning items at the supermarket checkout, playing musical instruments for extended periods of time on a daily basis, assembly-line work, especially that requiring heavy gripping or the use of vibrating machinery, and the use of power tools such as for lawn care. It is more common in women, perhaps as much as three to seven times more than in men, especially during pregnancy, and also in individuals who are obese, or have diabetes or rheumatoid arthritis. It is also more common with advancing age. 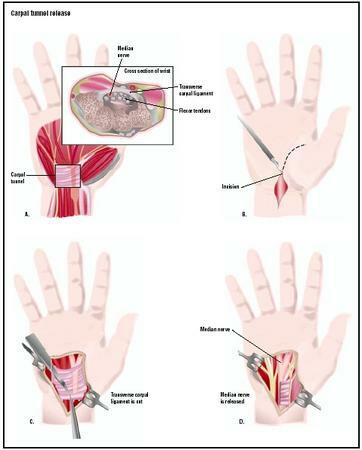 Carpal tunnel release is one of the most common hand surgeries performed in the United States. and the tendons that help bend the fingers. This nerve is called the median nerve. The symptoms start gradually and continue to increase if the problem is not addressed. Numbness and tingling in the fingers are usually the first signs of the condition. It may come on while driving, sleeping, holding a telephone, or reading a book. It may also occur after a long bicycle ride, which involves gripping the handlebars. The pain or tingling might begin to travel up the arm to the shoulder. The individual may appear clumsy, drop objects, or have difficulty holding on to a glass. There may be a decrease in the ability to feel sensations in the hand. Once the problem interferes with daily activity, including sleep, or persists for longer than two weeks, it is important to seek medical advice. This is because the symptoms, even if they are not terribly disabling, can become permanent, as the damage to the tissues themselves becomes permanent. Because of the nerve innervation routes, the one finger that is not involved in carpal tunnel syndrome is the pinkie. Conditions such as carpal tunnel syndrome are sometimes referred to as cumulative trauma disorders. In these disorders, the injury is not related to one major incident that causes damage, such as a fall that results in a fractured limb, but is the build up of small microtraumas, in which the affected area is repeatedly damaged. Each small injury causes the area to become irritated or inflamed, and there is not enough time in between injuries for complete healing to occur. Treatment focuses on relieving the compression of the nerve and decreasing or eliminating the irritation and inflammation of the area. A term often associated with microtraumas or repetitive stress injuries is ergonomics, which means the way in which the body is set up to perform a certain function. If the function is typing, an ergonomic assessment would include looking at the height of the desk, the height of the chair in which one is sitting to work at the desk, the height of the hands in relation to the work area, such as the keyboard, and the angle of the wrist, elbow, hips, and knees. An ergonomically designed work station would have all components at the right height and angle for work so that there is no strain put on any joint as it performs its necessary function, and therefore no injury can take place. For those who use vibrating tools at work, special gloves exist that are padded and designed to decrease the effect of the vibration. The diagnosis of carpal tunnel syndrome most commonly occurs because the individual seeks medical advice for numbness and tingling in the hand, especially while holding a telephone, newspaper, or holding onto the steering wheel, or has experienced dropping objects. A thorough medical and medication history and a physical examination , especially for checking the nerve pathway functioning in the arms and hands, are essential components of a full diagnostic workup for carpal tunnel syndrome. It is important to be able to rule out other medical conditions such as a pinched nerve in the neck, which may present with similar symptoms. A complete account of symptoms, including which fingers are involved, is important because the median nerve, the nerve involved in carpal tunnel syndrome, does not innervate the little finger. The timing of the symptoms is also important, because it indicates what activities set off the symptoms, such as while reading a book or having the hands placed on the steering wheel. Symptoms often occur at night because the hand gets set in a certain position for extended periods of time. Many people find that their hand is numb when they wake up in the morning, or that they wake up during the night with pain in the affected hand. To get relief, the individual may hang the hand off the bed, rub the hand, or shake it until the tingling goes away. Since, for many sufferers, the symptoms are worse at night than during the day, it may take time to associate the symptoms with the problem causing them. For some people, the symptoms come on, especially at first, only at work, because that is where the hand has to exert more than usual force in an awkward position. For others, the symptoms may come on when engaging in a hobby such as painting, gardening, knitting, woodworking, lifting weights, or playing a musical instrument. What begins as periodic symptoms may progress to constant symptoms, and mundane tasks such as unscrewing a bottle top or turning a key in a lock become extremely painful, or even impossible to perform. The doctor will want to try to elicit the symptoms by placing the hands in the same position as when the symptoms come on naturally. Carpal tunnel syndrome is sometimes referred to as entrapment neuropathy, which means that a nerve, in this case the median nerve, is entrapped or compressed. In carpal tunnel syndrome, the median nerve is compressed, usually by swelling and inflammation, as it passes from the forearm into the hand through the carpal tunnel. The compression puts pressure on the nerve, which is what elicits the tingling and numbness felt by the patient. Compression can arise from a condition that causes the carpal tunnel to become smaller or narrower, or by something such as fluid retention, which would increase the volume inside the tunnel. In addition to trying to assess what nerve is involved in the problem, the doctor will want to see if strength in the hand has been affected. As part of the neurological exam, the doctor may tap at the base of the crease of the wrist. If this tapping brings on tingling in all the fingers except the pinkie, it is said that the Tinel's sign was positive. A positive Phalen test occurs when the two hands are placed back-to-back and held in that position for 60 seconds, bringing on symptoms. By extending the hands out of that position, symptoms are relieved. If these tests are positive, the doctor may want to order nerve conduction studies, although it is possible for conduction tests to be normal when the individual suffers from carpal tunnel syndrome. Once diagnosed, the first line of treatment for carpal tunnel syndrome is usually conservative in nature. This means that surgery is reserved as a last resort. Initial treatment may include taking frequent rest breaks from aggravating activity (if the activity cannot be completely avoided), anti-inflammatory medication, physical therapy, and using a splint or brace to keep the wrist in a neutral position; the splint is usually worn at night. Activities that bring on the symptoms are eliminated, avoided, or altered in some way to change the stress on the nerve. Tests to rule out conditions such as hypothyroidism may be conducted. If the problem is work-related, an assessment of the work environment from an ergonomic standpoint will be important. Work positions and tools used may need to be modified or changed completely. If symptoms persist after conservative treatment, the injection of a corticosteroidal medication may be the next line of treatment suggested. This is an anti-inflammatory medication, but because it is injected directly into the area affected, it has a greater impact than medication that is taken orally. If injections are being considered, it is important that the doctor have considerable skill and experience in administering these injections, with a thorough understanding of the anatomy of the wrist and hand. After the injection, a restriction on any wrist movement will be imposed for several days, usually followed by the wearing of a wrist splint for about one month. Finally, hand and wrist exercises to stretch the tendons as well as increase hand strength may be recommended. While the injection tends to give good short-term results, long-term results are less promising. When symptoms are not relieved by these more conservative measures, then surgery may be the next step. It is estimated that about one third of patients will not respond to conservative treatment and will require surgery. Surgery may be performed in the more tradition fashion, or endoscopically. In traditional surgical treatment, an incision is made in the palm of the hand to openly expose the underlying structures. In endoscopic surgery, a smaller incision is made in the palm or wrist into which endoscopic instruments are inserted. In both techniques, entry into the carpal tunnel is made and the tissue called the transverse carpal ligament is cut, which stops the compression on the median nerve from continuing. Extreme caution is taken to avoid cutting additional anatomical structures or damaging the surrounding nerves. Early reports on endoscopic surgeries showed an earlier return to work and routine activities, but with a higher incidence of nerve and tendon injuries. However, in 2002, several studies were reported showing endoscopic surgery to be comparable or superior to open excision surgery, without a higher rate of complications. Initial postoperative care while the individual is still in the surgical center involves making sure that circulation in the hands and fingers has not been compromised. There should be a strong radial (wrist) pulse, and the fingers should be their normal skin color and warm to the touch. The individual should be able to move all fingers equally, and there should be no edema. A splint may be worn for about a month to help keep the wrist in a neutral position. This may be followed by exercises to both stretch and strengthen the hand, fingers, and wrist. Any accommodations in the work or home environment will need to be made to prevent further problems. All surgical procedures involve some risk of infection through the operated site. Sharing all pertinent past and present medical history with the surgical team helps to lower the chance of a complication. In addition to the risk of the surgery itself, there are the risks associated with anesthesia. In carpal tunnel release surgery, anesthesia is more localized, which lowers the chance of complications. Nonetheless, it is important to share with the anesthesia team the list of all the vitamins, herbs, and supplements, over-the-counter medications, and prescription medications that the patient is taking. Drug interactions can be significant, especially if the anesthesia team does not have all the necessary information to make the best anesthesia choices for a particular patient. Complications such as nerve damage are linked with poor surgical technique. Whether or not a full recovery is achieved depends on several factors. The most important factor is if there has been permanent damage to the nerve or tissue fibers. If muscle atrophy occurred because the condition went untreated for a significant period of time, full recovery is unlikely. If no permanent damage resulted, then full recovery would be expected. Recovery is expected to take about six to eight weeks. Occupational rehabilitation may take an additional month. Those for whom the condition was work-related will need to address the causative factors before returning to work. The research literature does not indicate a significant mortality risk with carpal tunnel release. Morbidity complications are small, and it is a safe enough procedure to be done during pregnancy. Nerve block anesthesia decreases morbidity and offers pain relief from the wrist to the fingertips. A 2001 Swedish study showed a 91% patient satisfaction rate with the release surgery several years after the surgery was done. According to a 2002 study, recurrent scar formation was the most common complication. Individuals considering surgery should investigate the complication rates with the surgeon, as well as the surgeon's and the facility's record. Conservative treatment is the main alternative to surgery. A "wait and see" method is not a realistic form of treatment, as symptoms worsen over time, and the risk of permanent damage exists. Some acupuncturists treat carpal tunnel syndrome with success, though research studies have not been done in this area. A 2002 British study looked at the use of the homeopathic medicine, Arnica, for postoperative pain following carpal tunnel release. In the 37 patients tested, researchers found a significant decrease in pain reported by those taking the Arnica. A July 1998 study reported that about 70% of patients who undertook a specific exercise program for their carpal tunnel condition reported good results, and they were able to avoid surgery. Barker, L. Randol, John R. Burton, and Phillip D. Zieve, eds. Principles of Ambulatory Medicine, 5th edition. Baltimore, MD: William & Wilkins, 1999. Fihn, Stephan D. and Dawn E. DeWitt. Outpatient Medicine. Philadelphia: W. B. Saunders Company, 1998. Braun, R. M., M. Rechnic, and E. Fowler. "Complications Related to Carpal Tunnel Release." Hand Clinics 18, no. 2 (May 2002): 347–57. Filippi, R., R. Reisch, D. El-Shki, and P. Grunert. "Uniportal Endoscopic Surgery of Carpal Tunnel Syndrome: Technique and Clinical Results." Minimally Invasive Neurosurgy 45, no. 2 (June 2002): 78–83. Jeffrey, S. L. and H. J. Belcher. "Use of Arnica to Relieve Pain after Carpal-tunnel Release Surgery." Alternative Therapies in Health and Medicine 8, no. 2 (March/April 2002): 66–68. Mayo Clinic. 200 First St. S.W., Rochester, MN 55905. (507) 284-2511. http://www.mayoclinic.com . The carpal tunnel release surgery is done by an orthopedic, plastic, or neurosurgeon. Patients considering carpal tunnel release should find a surgeon who performs this and other hand surgeries on a regular basis. The surgery is done on an outpatient or ambulatory basis. Will I be able to return to my regular work? Can both wrists be done at the same time? Is this a work-related condition? How soon will I be able to drive? When can I return to playing sports? What complications have you seen in the surgeries you performed? What other complications might I encounter? The questions to be asked to the doctor,if answered here would be very helpful to patients with this defect. Sue, I had the same experience that you had. My first surgery went smoothly. I had my second carpal tunnel release April 6 and I have not been able to get a good night's sleep since. I am now going through physical therapy. HI my first ctr on the 28th april this year omg was really painfull, i had to have 2 lots of annestetic as i had a shocking pain run up my arm while he was operating it took the surgen 40 mins to do, as he was stiching it up i could feel him doing it as the anesthetic was wearing off ,i also nearly fainted ,i had my stiches out after 7 days it wasnt healed propley either, Then on the 5 june i had my 2nd ctr on my left hand witch went smoothley took him 12 mins to different surgen didnt even now he had stiched it up , 7 days later had stitches out and i can already use it ,my 1st ctr on my right hand was 8 weeks ago and i still cant use it still in a lot of pain with it ,it feels worse than before ihad it done ,i went bck to see the doctor this thursday and she thinks ive received nerve damage and that i might have to have an exploratry surgey,does anyone have any idea what the shocking pain was ,as i didnt get it the second time round,my doc said it seems like uve ad a run of bad look with the surgen ! Good article. My first sugary done about 10 years ago was wonderful. I recovered in a matter of two weeks without any complications, and very little pain meds. I am into my third week since the other hand was done. The pain, swelling, numbness, and lack of feeling in my fingers has gone from bad to worse.my fingers are pale, and stiff, and I can't properly make a fist. The pain is keeping me up at night, and nerve meds like neurontin do not help, except to make me sleepy. My surgeon says, "give it Time." but my symptoms are getting worse daily. I can hardly use my "surgery hand" to do anything. I need help badly! I had CTR in July 2011, Ive got it in both hands so i decided i would have both done at once, i had big bandages on both hands a bit like boxing gloves, i had the bandages removed after a week and just had a plaster on both scars, i had the stitches removed after 2 weeks, i found it very difficult to do anything at all, i went back to work after a month on light duties but couldnt do hardly anything so i went back off sick all in all i was off work for a total of 3 months, the op was done under local anastetic, i was given codiene phosphate, paracetamol and ibuprophen for the pain, which was well needed as i had alot of pain. Now almost a year on it didnt work in either hand so im now on the operating list for Extended Carpal Tunnel Decompression which means me having a general anastetic and a bigger incision quite a way down my arms but this time i cant get away with having both done at once as ive been told its a more complicated operation. Had right hand done August 23 and left is scheduled for Oct 18th. The worst pain was the needles being injected into my palm, after that I felt nothing for over 18 hours. My hand was completely frozen from 1:30 in the afternoon until the next day, but when the freezing came out I was prepared with pain meds. I have some pain where the incision was, the stitches came out and it provided relief because they felt tight. I cannot do things as before yet but it has just been three weeks. I would never have both done at once, not a chance. I know the healing is going to be a while longer and am concerned about being ready for the next surgery, but completely confident in my surgeon. Just had CTR mini-open performed on Dec 13, 2012 on my right wrist 3 days ago. They used a nerve block and light sedation which I remember talkng to him and hearing some discussion during the procedure that took 28 minutes but no pain. I kept hand elevated and used some icing on day 1 and was able to slowly move fingers to make a fist immediately post op. The pressure wrap will be on until Dec 26 ( 13 days) which limits a little palm and wrist mobility and I can't see the healing or surgical site until then. Only used Aleve 12hr for first 48hrs and nothing today. Continued to open and close fingers (limit wrist flexion) throughout the day and I can tell my grip and strength is slowly getting better. I did notice occasionally as I use the hand a sharp quick shooting pain in the surgical area or down the fingers but it goes away. Is this typical post op on Day 3? I was given very little instruction regarding movements allowed so I am just slowing and carefully using fingers/hand to my tolerance. So far I am happy with the recovery and surprised with the movement I already have. Just concerned that the healing continues and the shooting pains resolve as normal strength and movement returns. Had my right hand (dominant hand) done on January 23, 2013 (7 days ago). Not nearly as painful as I expected but incision is a lot bigger than I thought. So far everything seems as if it was successful. The only problem I have is every time I touch something with my thumb with slight pressure, I get this shooting, painful zap through my thumb to my wrist. I have my follow up tomorrow so I will ask why then. Otherwise, the pain is minimal, I have pretty good movement in my fingers and hand. Yes, it is very sore if I try to pick up something or if I try to make a fist, but that's all expected. Time will tell if I am happy with the results. I'm hoping to be back to golfing by spring. At this point I would say I would definitely do it again. Good luck to all my fellow CTRer's. I had my left hand done 11/29/2012 and the right hand on 12/19/2012. I regret this surgery more than anything. I still cannot grip, twist door knobs or write without pain. No physical therapy was ordered for me which I blame myself for not asking why. The pain in the palms of my hands, the joints of my wrists and fingers and the shooting pains going up my forearm into my shoulders keeps me up at night even. I stretch them and do exercises but the therapist has arranged for me to go to a specialist in a large city that deals only with hands. Do your research - all surgeries can go bad for whatever reason - I thought this was a simple procedure but unfortunately it is worse than ever now. I had open mini-incision CTR on my right hand (dominant) on 2/5/2013. Scheduled to have left hand done on 2/19/2013...just 2 weeks apart. Wondering now if scheduling so close was the right decision. It's been 8 days since the first surgery (stitches came out today) and I'm still having a fair amount of pain. The incision site hurts a lot (which I expected), but I'm also getting these weird electrical shock-type sensations in my hand periodically. Feels like I'm being "zapped". Doctor says this is normal and is an indication that the nerves are trying to recover and heal. I truly hope this was all worth it, down the road. I'm anxiously looking forward to finally being able to ride my bicycle long distances without the excruciating hand pain and numbness. I just had my CTR surgery on 8/7/2013 to my right hand and a shot to my left hand. Left hand hurt terribly for 1st 72hrs but I'm now able to use hand without pain. My right and dominant hand however, is another story. I'm unable to sleep during the night. I only had a dressing, and not a splint, placed after surgery which now has me wondering if that would have made a difference. The pain is 10x worse than before. At first I thought it was due to swelling from surgery until I noticed that the swelling and numbness has gone away in my pinky but still persists in the rest of my fingers. I've applied ice as instructed but nothing seems to help. The incision itself is sore as expected but the numbness, tingling, and sharp, electrifying shooting pain does not seem to want to go away. Which I'd seen this page and these compliants prior to surgery. I have moderate to severe carpal tunnel in both wrists, which is work related. my job made it clear for me to have surgery on friday so that i can return back to work on monday can this be possible? on top of that the restriction i am on right now are hurting me worse,they have me doing jobs like sweeping,vacuuming,wiping tables,and using a large push broom. i have told my HR that these jobs are bothering me and causing my pain to worsen and she said the restriction where fine. my restriction are limit repetitive motion at wrists. 11 days after operation. Alot of pain and swelling? It sit still and can hardly move fingers? I had CTS 7 days ago . I am moving hand and finger well , I have hardly no swelling and not a lot of pain in my hand . That being said I do how ever have a really bad pain when I bend my arm . This pain is like being shocked from my elbow to my wrist when I extend it, this pain is on the inner side ridge like to my thumb . Is this normal ? I can not get any relief. after the carpaltunnel operation my finger tips have atrophied and i have no feeling except coldness is there any physio that can help as i cannot pick or feel small objects very frustrating.would be greatfull for advice. I had CTR on my lefthand last Feb. 2,2016, experienced a lot of pain during night time,until now my fingers still swollen, the neurologist referred me to Kinesisttherapist but the swelling did'nt change and the pain still there. I had cts May2015 almost a year now in both hands. I now have trigger finger in my lft thumb and its spreading. Im in constant pain but still working. The surgeon will not see me again. Im afraid that soon i will not be able to use my hands at all. What do i do now?